When, where, and how do we best measure the national pulse of an "American" music? What is it about a place, a stage, a literal and figurative platform for the American dream of musical success that brings people back to perform, to watch, to believe in the potential of making a permanent connection? Our food, our language, and so much of who we are as a functioning society has been expressed through the pulse of our immigrant sensibility. We have plucked banjos and bowed fiddles at the Ryman Auditorium, lived our dancing and singing lives at the greatest theaters on Broadway, and created a world of jazz, rhythm and blues, soul, and early rock 'n' roll at the Apollo Theater, Harlem's premiere showcase for the greatest African-American talent. Since 1934, from deep within the Harlem Renaissance through to the present time, the Apollo has stood to represent and speak for the heart and soul of a national sound. Who were we? How did we get here? Can a legendary venue like The Apollo really prove worthy of its reputation? "All that matters is that the tale is told. That the history they lived -- a history that means so much to them -- is passed on and preserved." It's difficult to measure the true effectiveness and success of this graphic adaptation of Fox's original 1983 history, but clearly the update was necessary. Much had transpired at the Apollo in the ensuing 36 years, like Barack Obama singing a line from an Al Green song at a 2012 campaign rally and respective concerts by the Rolling Stones, Bruce Springsteen, and Paul McCartney. The long-running TV variety show Showtime at the Apollo (Fox) would not have its debut until 1987, airing over 1,000 episodes and running until 2008. The reader cannot help but be swept away by Fox's reverence for all the characters he meets and features throughout this narrative. 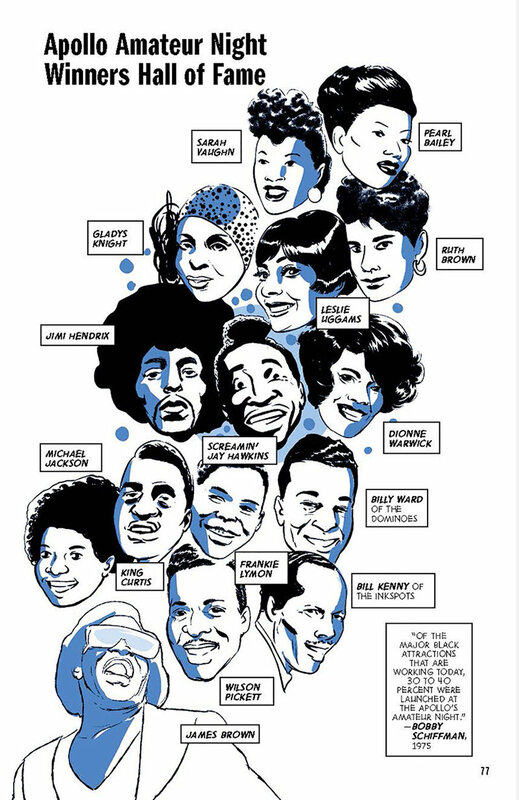 Smith's illustrations are equally loving and embrace the hope all these performers seemed to feel that the success they could attain on the stage of the Apollo would speak for everybody in the theater, in Harlem, and the world. Fox is working with an overwhelming wealth of great characters here. The Apollo is at times a literal home for these performers. Early on we meet Louis Armstrong, James Brown, Ella Fitzgerald, all welcoming each other, sitting in their rooms waiting for visitors Fox writes: "Advice is given and lessons learned. Deals are made. Songs, dance steps, and comedy bits are created." This early chapter can be head-spinning as the reader turns each page and sees Ray Charles, Gladys Knight, Leslie Uggams, Little Anthony and Stevie Wonder. James Brown's 1963 album Live at the Apollo would cement both his reputation and the venue's as a place where every move was like a bolt of lightning hitting at the most ideal time. Could it be credited to Brown, the venue, or both? 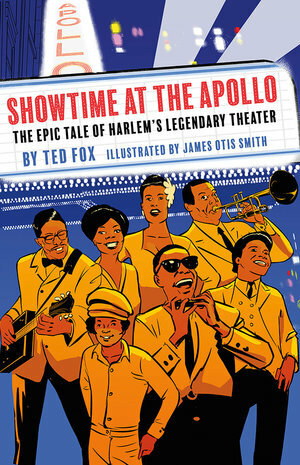 In Chapter Two, "Harlem Before the Apollo", Fox properly puts the venue in its historical context. This place blossomed from the legacy planted by the greatest intellectuals of the Harlem Renaissance: Zora Neale Hurston, Countee Cullen, and Langston Hughes (among many others.) The Cotton Club and the Jazz Age of the '20s gave voice to Duke Ellington, Fats Waller, and Cab Calloway. Lena Horne starts at the Cotton Club as a 16-year-old chorus girl. Fox writes: "The shows had a primitive, naked quality that was supposed to make a 'civilized' audience lose their inhibitions." Fox includes a fascinating chart in this chapter that illustrates the black migration in Manhattan in the three centuries from when Africans were brought to America as slaves to what became Lower Manhattan through to the early 20th century, when Harlem became the fashionable, affordable place for African-Americans. History, location, and fate seemed to conspire for the magic that came from the Apollo, and the reader can't help but get swept away in Fox's reverence for it. "In another practice some condemn as degrading, until the late '40's most black male comics wear exaggerated burnt-cork 'blackface' makeup. Despite protests from the NAACP and others, the comics say they feel naked without it." Fox manages to put everything in context here, especially when discussing the string of theaters in the country where black performers were welcome (and in many cases allowed) to work in pre-civil rights era America. It's about the Chitlin' circuit and "The Green Book". In short, the Apollo was the premiere venue for African-American talent, but it wasn't the only one. In Chapter Four, "Amateur Night at the Apollo", Fox gives us a clear picture of options available for talented young people in mid-20th century America: "While starstruck white kids traditionally head for Ollywood or Broadway… their black counterparts… beat a path for Harlem and the Wednesday night Amateur Show at the Apollo." The names of performers in Fox's Apollo Amateur Night Winners Hall of Fame are legendary: Sarah Vaughan, Pearl Bailey, Michael Jackson, Wilson Pickett among many. Audiences could be merciless, and we see rough starts from singer Lauryn Hill and comedian Chris Rock. "Failure became a mandatory part of the show," Fox writes. "Those who fail to give the Apollo crowd their all, or attempt to elevate themselves at the audience's expense, always regret it." Later, Sammy Davis, Jr. explains: "It wasn't just being accepted as a performer. It was being accepted by your own people." If the only deficit in this volume is the amount of material that needs to be covered, the reader quickly feels assured that Fox is up for the task. 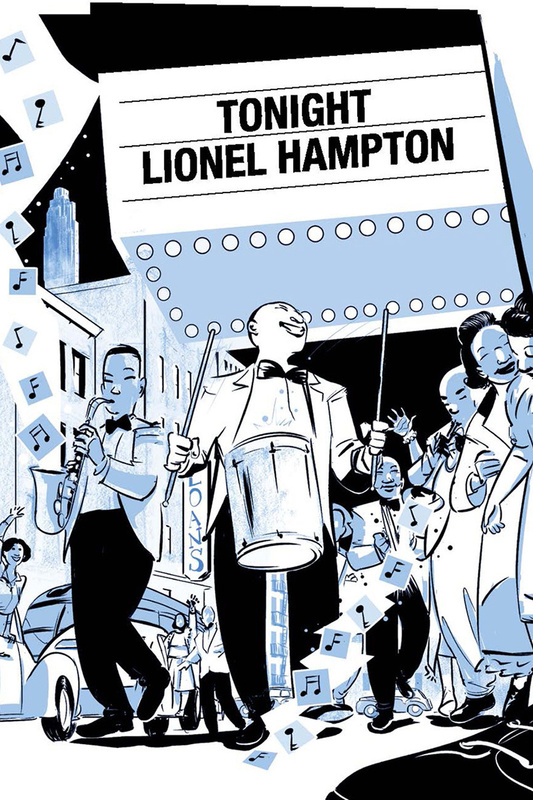 In Chapter Five, "The 1940's: Boppin'", Fox writes about the paradox that while enlisted forces in WWII were still segregated, "…swing becomes so popular that some top black bands break into formerly all-white territory, and play the Apollo no less." Harlem endures another major riot in August 1943, hundreds of white-owned businesses are torched, but the Apollo remains protected. Billy Eckstine, Dizzy Gillespie, and Charlie Parker start making themselves known in the neighborhood. The lives of Parker and singer Billie Holliday end tragically, but the story is balanced by the suave presence of Billy Eckstine, known in the press as "The Sepia Sinatra", Parker's bop revolution, Holliday's horrifyingly stark "Strange Fruit", and Eckstine's smooth crooning all played a major role in defining the era. Apollo comics eventually stop wearing blackface, and the country and its sounds move on. Atlantic Records founder Ahmet Ertegun brings The Drifters to the Apollo. Screamin' Jay Hawkins brings dramatic horror with "I Put a Spell on You". White acts like Buddy Holly, Bobby Darin, Jerry Lee Lewis, Buddy Rich and The Four Seasons pass the Apollo's high expectations and are warmly received. Fox addresses how "white" radio covered early black rock 'n' roll songs, effectively neutering them: "'The black community always had an honest, wholesome approach to sexuality,'" singer Johnny Otis recalls. Bowdlerized white versions of songs by The Chords, Big Mama Thornton, and Little Richard might have sold more records to the mainstream American public, but the damage they did to the essence of the lyrics and sensibility was immeasurable. "Things are changing… Whites aren't that comfortable coming up here anymore… We will always reach out to the people of Harlem who love this place." "The system the Apollo works within and against for so many years collapses. The general acceptance of black culture into American popular culture is the beginning of something new. But it is also the beginning of the end… Ironically, it is the Apollo itself that becomes a casualty of this revolution." Funk is the subject of the '70s (Chapter Nine) and James Brown makes more of his presence known in another powerful form. Harold Melvin and the Bluenotes, Patti Labelle, and the Delfonics are among the sound of Philadelphia (known as "TSOP".) The idea of "One Nation Under a Groove" (a line from Funk Master George Clinton and the Funkadelics), is a nice one for the music and the nation, but it won't pay the bills. This is where the original text ended, with the promise of the music living even while the Apollo is shuttered. In this text's Afterword, we get a happier conclusion. The Apollo is granted national landmark status in 1983. Al Green, Patti Labelle, and Little Richard perform with a New Jersey Gospel Choir. Barbra Streisand shoots her "Somewhere" music video on the Apollo stage, followed by many others (including Stevie Wonder, Whitney Houston, and U2). Hip-hop and rap acts like Ice Cube, Public Enemy, and Run-DMC are welcomed. Literary leaders like Ta-Nehisi Coates have their own featured nights at the Apollo. Everything old is new again. How do we measure the status of a performer's Holy Grail like the Apollo in 2019? Should it really be as important to us. the audience. as it has been for performers who made their names there? 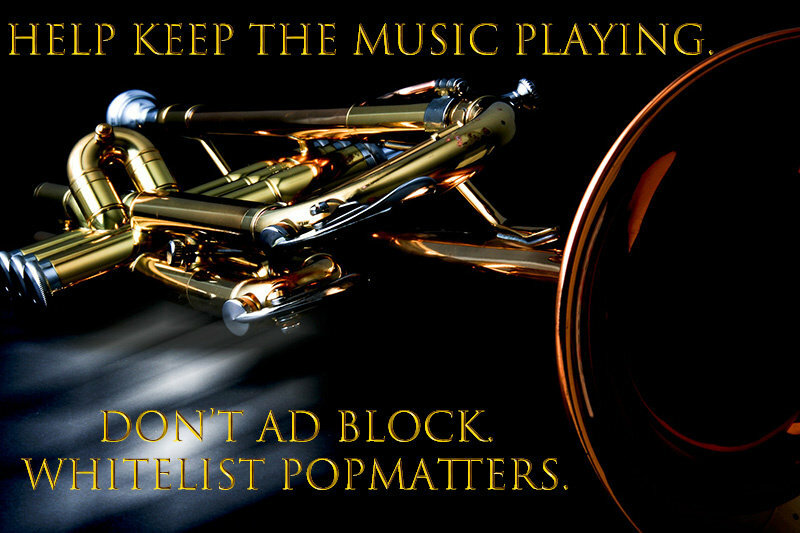 Consider the fact that so much entertainment these days is streamed and accessed through private means. There's a channel and platform for an infinite variety of interests and concerns. "Appointment viewing" is an antiquated term from the days before all highlights and clips are available for free (or for a nominal fee) the next morning on Youtube. James Otis Smith's illustrations make for a rich, beautiful, ideal accompaniment to Fox's narrative. Showtime at the Apollo could probably have worked better had it stayed with the forces behind the venue and the manner by which they dealt with historical obstacles and racial inconsistencies. White America has always both embraced and appropriated the music of African-Americans. The Apollo seemed to transcend issues of race when it came to performing. If you were good and respected the music, you were embraced by the audience. No matter the points where Fox's narrative could have benefitted from a greater focus (the socio-political history of the venue in the 20th century and beyond), this graphic version is a beautiful, heartfelt, and rich tribute to a musical form, a vital location, and a pure American vision of connecting with the audience in the theater and everywhere else. We can feel the Apollo's heartbeat on every page, and that sensation will make a true believer of even the most jaded reader.